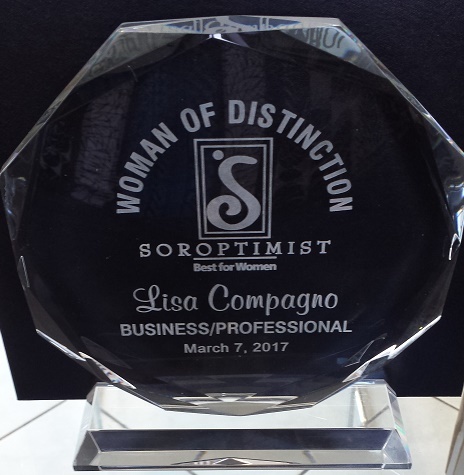 Congratulations to our own Lisa Compagno! 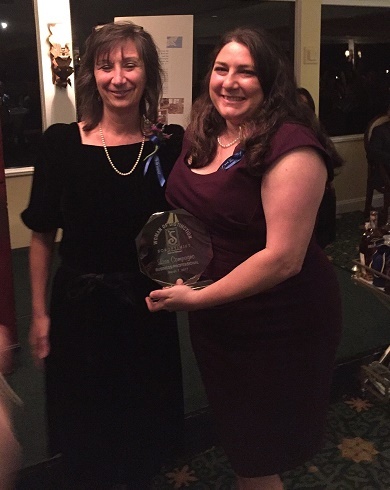 She was named one of this years Soroptimist's Women of Distinction1 Soroptimist International of Stuart is a club of business and professional women dedicated to bettering the lives of women and girls both locally and internationally. It has been chartered in Stuart since 1954 and has annually honored Women of Distinction in our community since 1992. The Women of Distinction Award recognizes women who (1) demonstrate high ethical standards personally, (2) is a recognized role model, (3) has a strong sense of community responsibility and (4) is outstanding in her contributions within Martin County. There are four awards, one for each of the following categories: "Business/Professional", "Civic/Professional", "Volunteer", and "Rising Star". Lisa was nominated in the Business/Professional category which recognizes "a women who is self-employed or employed by a for-profit business or corporation. She is recognized for her outstanding service in her field and significant contributions to the community through her profession." Lisa says she was very surprised to be this year's recipient of the "Business/Professional" category. She was nominated along with 10 other exceptional women in the community. Lisa thanked her family, her family's business and the wonderful community of Martin County for inspiring her to get involved and give back to the community through the family's business. We are so proud of Lisa and cannot think of a more deserving winner! To learn more about Soroptimist visit www.soroptimistofstuart.org.